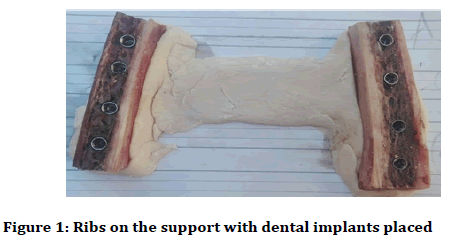 Method: Forty implants (n=40) were placed in bovine ribs and divided into two groups: (1.) control group (n=8) and (2.) test group (n=32). The test group was divided into two subgroups: T1 (0.45 mm peri-implant space), T2 (0.7 mm peri-implant space). Cone beam computed tomography (CBCT) and panorama (PAN) radio-graphical images were acquired. One oral and maxillofacial surgeon and two oral and maxillofacial radiologists evaluated the presence of defects, and their findings were compared with direct visual evaluation. Confidence in diagnosing the presence or absence of a periimplant radiolucency was recorded on a five-point scale. Sensitivity, specificity, positive predictive value (PPV), negative predictive value (NPV), positive likelihood ratio (LR+), negative likelihood ratio (LR-) and accuracy of the apparatus were calculated. Results: CBCT were better at diagnosing a peri-implant bone defect when the compared with PAN. Accuracy of CBCT (71.88%) was better than PAN (65.62). The sensitivity of PAN (80%) is better than CBCT (73.33%). Specificity and positive predictive value of CBCT better than PAN. The negative predictive value of PAN was higher than CBCT. Conclusion: Within the limitations of this study, CBCT are a reliable and valid method of detecting circumferential periimplant bone defects and performed significantly better than PAN. Specific attention has been directed towards postoperative radiographic assessment of marginal alveolar bone and tissue around dental implants under functional loading . The success of an implant also can be evaluated by the appearance of normal bone surrounding it and its apposition to the surface of the implant body. The development of a thin radiolucent area that closely follows the outline of the implant usually correlates to clinically detectable implant mobility; it is an important indicator of failed osseointegration . Peri-implant diseases can only be detected at an early stage (three-dimensional morphology with a bowl-shaped outline), if the diagnostic systems applied are sufficient. This involves a clinical examination and, if required, additional microbiological and immunological diagnostics. To make concealed anatomic structures (e.g., alveolar bones) visible, radiological scans are absolutely essential. This is the only way to make a safe assessment of the available bone and adjacent anatomical structures such as the maxillary sinus and mandible nerve . The radiologic follow-up of dental implants is a standard procedure in daily clinical practice. However, knowledge concerning the comparative performances of the modern devices available for this task is limited . The purpose of the present study was to compare the diagnostic potentials and practical advantages of PANO, CBCT, imaging systems in detecting bone defect around dental implants with different sizes. Fresh bovine ribs obtained from a local slaughterhouse were prepared by removing the soft tissues and cutting them into 10 blocks measuring approximately 45 × 16 × 12 mm (length/height/thickness) to simulate the size of the posterior region of the human mandible . The ten rib blocks were divided into five groups of two blocks each. Individual acrylic supports were made to stabilize two blocks simultaneously and simulate the spatial positioning of the mandible body (Figure 1). The ribs were frozen to maintain the moisture and integrity of the bone marrow. Forty implants (dentium company) were divided into two groups: (1.) control group (n=8) and (2.) test group (n=32). The test group was divided into two subgroups: T1 and T2. All the implant sites were to receive a 3.6 × 10 mm implant. The defect sites were randomly assigned to the groups. Bone defect were created in two stages. The first osteotomy prepared all the implant sites to 3.6 mm diameter and 10 mm length. The second osteotomy prepared the coronal 5 mm to 4.5 mm diameter (to create a 0.45 mm peri-implant space T1) and to 5 mm diameter (to create a 0.7 mm peri-implant space T2).The drill diameters (4.5 mm and 5 mm) were chosen as they were readily available drill sizes for use with wider diameter implants. The apical 5 mm was maintained at 3.6 mm diameter in all osteotomy sites to help stabilize the implants in a central position when the coronal 5 mm was increased in diameter. Prior to imaging, the bone blocks were hydrated by soaking in warm soapy water. The mixture served to reduce the surface tension of the bone thereby increasing its water absorption . 1. Peri-implant radiolucent space definitely not present. 2. Peri-implant radiolucent space probably not present. 3. Unsure if peri-implant radiolucent space present or not. 4. Peri-implant radiolucent space probably present. 5. Peri-implant radiolucent spaces definitely present (Figure 3). Interpretation time was unlimited, and the same images were analyzed repeatedly after a 2-week interval. Two oral and maxillofacial radiologists (OMRs) and one oral and maxillofacial surgeon (OMS) analyzed the whole CBCT volume of each sample. They were blinded to any information about the procedures performed and the conditions of the sample. The examiners were asked to assess the images and confident they were regarding the presence or absence of a peri-implant radiolucent space in the coronal half of the implant. All observation sequences were randomized and the images were viewed in a quiet, darkened room on a 15.6-inch laptop monitor (Lenovo V110) at a screen resolution of 16.9 (1.366 × 768 pixels). Table 1 shows the diagnostic evaluation of PAN apparatus when compared with direct visual examination as a gold standard, in which there is 20 true positive results, 6 false positive results, 5 true negative results and 1 false negative result. Table 2 shows the diagnostic evaluation of CBCT apparatus when compared with direct visual examination as a gold standard, in which there is 22 true positive results, 1 false positive result, 8 true negative results and 1 false negative result. 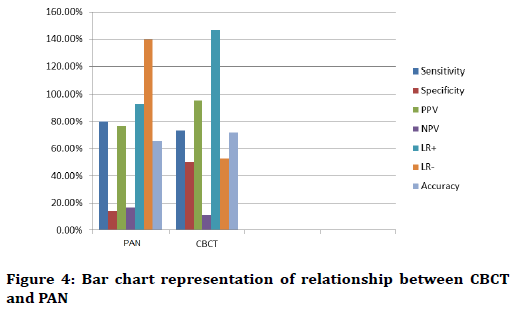 The Table 3 present the sensitivity, specificity, positive predictive value (PPV), negative predictive value (NPV), positive likelihood ratio (LR+), negative likelihood ratio (LR-) and accuracy, in which the sensitivity of PAN (80%) better than CBCT (73.33%) while specificity of CBCT (50%) better than PAN (14.29%). The PPV of CBCT (95.65%) higher than PAN (76.92%) while NPV of PAN (16.67%) higher than CBCT (11.11%). The positive likelihood ratios of CBCT (1.47) higher than PAN (0.93) while the negative likelihood ratio of PAN (1.40) higher than CBCT (0.53). The accuracy of CBCT (71.88%) higher and significantly better than PAN (65.62%) (Figure 4). In the present in vitro study, we used a bovine rib model. This model has been used in similar papers because the bone density and the relationship between cortical bone and bone marrow are similar to those of the human mandible [5,7,8]. In our study, we compared between CBCT and PAN for detection of mechanically simulated peri-implant bone defect, Bone defects measuring 0.45 mm and 0.7 mm, on average, were used to simulate two sizes of crystal periimplant bone defects. In this study, good values of, specificity and accuracy, positive predictive value, positive likelihood ratio were found for the CBCT analysis while PAN show good value of sensitivity, negative predictive value and negative likelihood ratio. Some studies [1,3,4,7,9-11] have sought to examine peri-implant bone defects using CBCT images. Among these, four studies [3,4,7,10] also compared CBCT with peri-apical radiography. Only the studies by Dave et al. and Sirin et al. have reported that periapical radiographs had a better performance than CBCT images. A study by Sirin et al. compared the detection of periimplant crystal bone defects of different diameters using peri-apical radiography, direct digital radiography, panoramic radiography, CBCT and multi-slice CT. The authors measured the duration of diagnosis in each image modality. They concluded that direct digital radiography may provide a faster and more reliable diagnostic option that is as accurate as panoramic radiography in detecting peri-implant radiolucencies. CBCT has a diagnostic potential comparable to that of these intraoral systems, but with slower decision-making capabilities and lower image quality, whereas panoramic radiography and multi-slice CT become more reliable when bone defects have a diameter that is at least 1.5 mm larger than that of the implant. In our study, we did not set a time for the analysis, since these factors were subjective and observer dependent, the quality of the analysis is more important than speed. In another in vitro study, conducted by Dave et al. , the authors tested the diagnostic accuracy of conventional peri-apical radiography versus that of CBCT in detecting peri-implant bone defects. They concluded that digital long-cone periapical radiographs performed significantly better than CBCT. However, this study had some problems, e.g. defect size was large, which may have favored the detection by periapical radiographs at any horizontal angulation. Another important issue was that the authors failed to observe the CBCT images correctly (presentation of CBCT images was static (signal) (rather than dynamic). Therefore, the CBCT results found by Dave et al. may have been underestimated . In another study by Kamburoğlulu et al. , the authors investigated the reliability and accuracy of CBCT images in detecting of simulated buccal marginal alveolar periimplant defects using different fields of view. Mechanical cavities of various sizes and dimensions simulating very large localized peri-implant defects were prepared on the buccal aspect of the marginal alveolar cortical bone using round and cylindrical dental burs. The authors concluded that all CBCT images performed similarly in the detection of simulated buccal marginal alveolar peri-implant defects, when compared with direct visual examination. Their results are in concordance with ours. In a study by Ritter et al. , the authors state that CBCT provides usable information about bone in all dimensions around implants with varying accuracy. According to the authors, intra-oral radiography and CBCT perform similarly in assessing both mesial and distal bone levels, but, within its limitations, CBCT can also access lingual and buccal bone. The CBCT results of those authors are in concordance with ours. In our opinion, cross-sectional imaging is used for the assessment of all dental implant sites and that CBCT is the imaging method of choice for gaining this information. However, in the absence of clinical signs or symptoms, only intraoral peri-apical radiography is advised for the postoperative assessment of implants. Cross-sectional imaging particularly (CBCT) is advised only immediately post operatively if implant mobility or altered sensation is reported. This recommendation is based on evidence that generally CBCT delivers far greater effective doses than does intraoral imaging. The main limitation of our study is that it can be used as an in vitro setup. In real clinical situations, multiple interferences (e.g. prosthetic metal artifacts, implant position, and the risk of the patient moving during the acquisition time) may hinder the diagnosis. Furthermore, we used only one CBCT apparatus; a single OMS analyzed the samples. It can be concluded that, within the limitations of this study, Dependent on these results the CBCT are a reliable and valid method of detecting circumferential periimplant bone defects and performed significantly better than PAN. The authors declare that there is no conflict of interest regarding the publication of this manuscript. Kamburoğlu K, Murat SE, Kılıç C, et al. Accuracy of CBCT images in the assessment of buccal marginal alveolar peri-implant defects: Effect of field of view. Dentomaxillofac Radiol 2014; 43:20130332. White SC, Pharoah MJ. Oral radiology-e-book: Principles and interpretation. Elsevier Health Sciences 2014. Mengel R, Kruse B, Flores-de-Jacoby L. Digital volume tomography in the diagnosis of peri-implant defects: An in vitro study on native pig mandibles. J Periodontol 2006; 77:1234-41. Sirin Y, Horasan S, Yaman D, et al. Detection of crestal radiolucencies around dental implants: an in vitro experimental study. J Oral Maxillofac Surg 2012; 70:1540-50. Razavi T, Palmer RM, Davies J, et al. Accuracy of measuring the cortical bone thickness adjacent to dental implants using cone beam computed tomography. Clin Oral Implants Res 2010; 21:718-25. Patel S, Dawood A, Mannocci F, et al. Detection of periapical bone defects in human jaws using cone beam computed tomography and intraoral radiography. Int Endod J 2009; 42:507-15. Dave M, Davies J, Wilson R, et al. A comparison of cone beam computed tomography and conventional periapical radiography at detecting peri‐implant bone defects. Clin Oral Implants Res 2013; 24:671-8. May KB, Edge MJ, Russell MM, et al. The precision of fit at the implant prosthodontic interface. J Prosthet Dent 1997; 77:497-502.
de-Azevedo-Vaz SL, de Faria Vasconcelos K, Neves FS, et al. Detection of periimplant fenestration and dehiscence with the use of two scan modes and the smallest voxel sizes of a cone-beam computed tomography device. Oral Surg Oral Med Oral Pathol Oral Radiol Endod 2013; 115:121-7. Ritter L, Elger MC, Rothamel D, et al. Accuracy of peri-implant bone evaluation using cone beam CT, digital intra-oral radiographs and histology. Dentomaxillofac Radiol 2014; 43:20130088. Kamburoğlu K, Kolsuz E, Murat S, et al. Assessment of buccal marginal alveolar peri-implant and periodontal defects using a cone beam CT system with and without the application of metal artefact reduction mode. Dentomaxillofac Radiol 2013; 42:20130176. Citation: Ahmed R Naje*, Ban F-Al Drobie, Ali Falah, A comparison of cone beam computed tomography and panoramic radiography in the detection of mechanical created peri-implant bone defects, J Res Med Dent Sci, 2019, 7(1): 222-225.